Despite weather more akin to Bermuda in December, Bermuda’s women’s cycling team won the gold medal in the town criterium. The team includes Zoenique Williams [individual silver medalist], Gabriella Arnold, Alyssa Rowse and Claire Mitchell. Bermuda’s men’s national cycling team competing in the NatWest Island Games cycled superbly as a team to win the silver medal in the men’s team criterium. Matthew Olivera chased down the leaders to finish third overall. The men’s cycling team includes Che Quan Richardson, Dominic Mayho, Matthew Olivera and Kaden Hopkins. 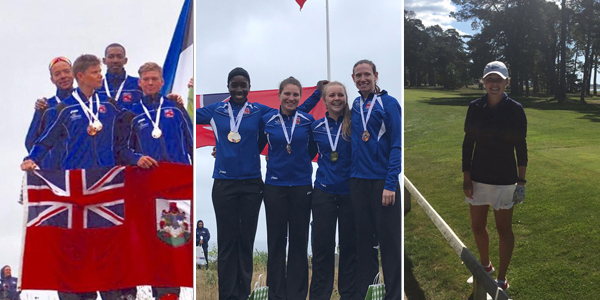 Bermuda’s Elizabeth Parsons finished fourth overall in the golf tournament, with the team finishing fifth. The men’s team saw Jarryd Dillas finish as Bermuda’s top player in fourth position, with the men’s team finishing fifth.